World-renowned quilter Kaffe Fassett has done it again! Spectacular quilt designs and colorways created by Kaffe and his team of designers are showcased in Kaffe Fassett's Quilts in Ireland. 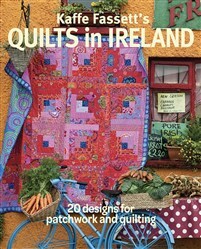 Kaffe's inspiration for the 20 eye-catching quilts in this book was the brilliant colors of western Ireland, with its rich greens of the rural landscape, the stunning colors of the individually painted cottages, and the rich interior of one of Ireland's handsome country houses. Each of the quilts featured in Kaffe Fassett's Quilts in Ireland is made using new fabrics from the Kaffe Fassett Collective as well as Kaffe's favorites from his other fabric collections. These options give quilters the perfect choice of color-coordinated motifs that reflect the diversity of western Ireland. The soft tones of Kaffes' Green Diamonds quilt blends perfectly with the delicate mosaics in the historic Glenville House, while the rich dark tones of his Persian Carpet design sing out against the gothic ruins of a former chapel. In a different color key, the brilliant pinks and reds of Kaffe's Red Log Cabin quilt stand out against the bright orange walls of an Irish cottage shop front. In addition to the gallery of quilts, Kaffe Fassett's Quilts in Ireland provides detailed information on how to make each featured quilt, along with general patchwork and quilting information. San Francisco-born artist Kaffe Fassett is a name every quilter knows. His work has been commissioned by the British monarchy, American fashion designers, and the Royal Shakespeare Company. More than a decade ago, Fassett partnered with Rowan to create the Kaffe Fassett Collections, which debuts new fabrics each fall. He has written numerous best-sellers including Kaffe Fassett's Quilts in Italy, Kaffe Fassett's Quilts in Morocco, and Kaffe Fassett's Quilts in the Sun.